This entry was posted in Progressive policies and tagged community, economics, politics, progressive, Society on August 24, 2018 by Geoff. This entry was posted in Political commentary and tagged ANU, politics, Ramsay, Society, Tony Abbott, Western civilisation on July 7, 2018 by Geoff. This entry was posted in Political commentary and tagged corruption, democracy, Labor, leadership, Neoliberalism, Society, values on April 22, 2014 by Geoff. An article by Bob Douglas on the dire need for real political leadership prominently features Sack the Economists, along with a new book by prominent Australian economist Ross Garnaut, Dog Days: Australia After the Boom, the latter launched by prominent Liberal politician Malcolm Turnbull. Tony Abbot deposed Turnbull as Leader of the Opposition in 2009, winning by one vote, otherwise Turnbull would probably now be Prime Minister. See Bob Douglas’ article in the Sydney Morning Herald here. It also appears in the Melbourne Age and the Canberra Times. This entry was posted in Economies and economics and tagged free markets, leadership, Neoliberalism, Society, tipping points, values on January 8, 2014 by Geoff. My ebook Sack the Economists and Disband their Departments is now available. Mainstream economists completely failed to anticipate the financial market crash of 2007-8. They then called it an unforeseeable event. This is a clear admission that they don’t understand how economies work. Yet many non-mainstream, marginalised economists gave clear warning of the approaching crash. 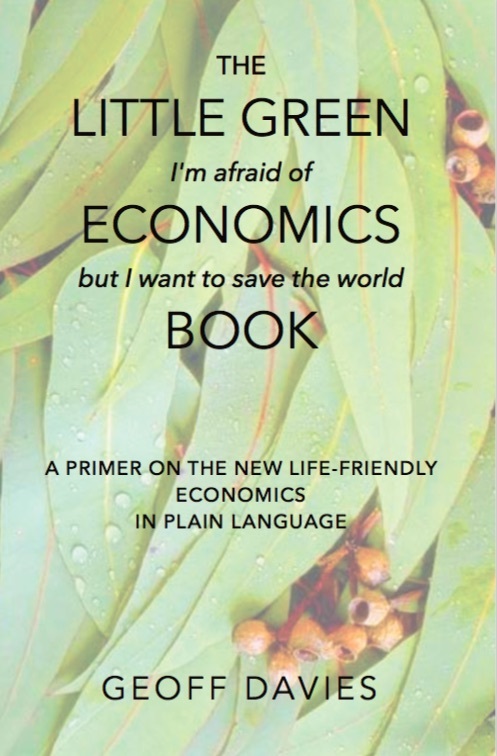 This book shows how mainstream economics has not one but many fundamental flaws. It is not a science, it is pseudo-science. It lacks scholarly rigour and integrity. Once you understand this, it is not a mystery why the mainstreamers missed the approaching crash, nor why wealth is so unequally distributed, why we are so materialistic and unfulfilled, and why the planet is being destroyed. But modern knowledge and systems ideas reveal market economies to be self-organising systems, and they can be managed to support dignified livelihoods in equitable societies that can survive into the indefinite future, with nature thriving along with them. See more at the book’s web site, including how to purchase your copy. Visit the Facebook page, like it and spread the word. This entry was posted in Economies and economics and tagged financial crisis, free markets, Mainstream economics, Neoclassical economics, Neoliberalism, quality of life, self-organising systems, Society on November 26, 2013 by Geoff. Part 3 of 3 on Independent Australia. In this final part of his three part series, Dr Geoff Davies surveys the current political scene, including the disarray of the Labor Party, from a longer perspective. This entry was posted in Political commentary and tagged democracy, extremism, Labor, leadership, Neoliberalism, politics, radical right, Society on February 24, 2013 by Geoff. But there was another sort of conservative, who would be less familiar now. This entry was posted in Political commentary and tagged Catholic social teaching, free markets, radical right, Republican, Society, Traditionalist conservatism on September 28, 2012 by Geoff.